Of all types of home issues, plumbing problems seem to be some of the worst. Water leaks can wreak havoc on a home and cause irreparable damage. They can also raise the cost of home utility bills. In fact, fixing easily corrected household water leaks can save homeowners about 10% on their water bills. Of course, staying proactive and looking for signs of plumbing distress is the best way to avoid a problem before it arises. Here are just a few red flags that indicate that it may be time to hire a plumber. It’s normal to hear signs of water flow when someone is using water in your home, but if not, something could be amiss. Take a walk through your home and look for major signs of leaks: brown spots on ceilings, walls, or floors. If you can locate the leak, feel the temperature of the water. If it’s warm, you’ll be able to tell the plumber ahead of time so they don’t spend more time than necessary locating the leak. If you’re still unsure whether or not the noises you’re hearing from your pipes are normal, look at your home’s water meter for more info. If it’s spinning when no water is being used, there’s almost definitely a leak that should be addressed as soon as possible. When drains become clogged with hair and debris, it can take much longer for them to drain properly. Most of the time, buying a store-bought clog removal product like Draino should help to alleviate the problem with a clogged drain. But if you notice that your kitchen or bathroom sink has a clog that isn’t solved with traditional methods, it’s probably time to hire a plumber. Trying too hard to unclog drains can actually cause even more damage to your pipes. Finally, low water pressure may be another indicator of a leak or other plumbing problem. Sometimes, water pressure can be restored when you clean out the faucet’s aerator, but if the problem persists, there’s likely a bigger underlying issue, such as a fractured pipe, water leak, or eroded water line. 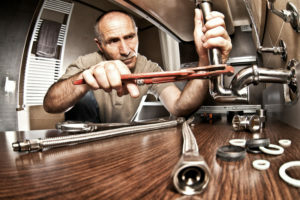 In these cases, it’s definitely best to leave the troubleshooting to a plumbing contractor’s expertise. Ultimately, being proactive about your home’s plumbing system is the best way to avoid these issues from becoming serious. Know when to call a plumber. For more information about plumbing services such as toilet repairs, contact HJ Pertzborn Plumbing and Fire Protection.